SOON TO BE FEATURED ON 'ESCAPE TO THE COUNTRY' - Set in the heart of the beautiful village of Symonds Yat an Area of Outstanding Natural Beauty, The Cover is a unique 3/4 bedroom property set in an elevated position commanding fabulous river and countryside views. The original part of the property dates back to the Victorian era and has undergone refurbishment which has benefited from a new contemporary extension, creating a stylish country home which flow seamlessly together. OVERVIEW Set in the heart of the beautiful village of Symonds Yat an Area of Outstanding Natural Beauty, The Cover is a unique 3/4 bedroom property set in an elevated position commanding fabulous River Wye and countryside views. This property would make a fabulous holiday let for those who are looking for an investment. The original part of the property dates back to the Victorian era and has undergone refurbishment which has benefited from a new contemporary extension, creating a stylish country home which flow seamlessly together. Open Plan Dining Kitchen: A fabulous space for entertaining with picture windows overlooking the river views and countryside. Flagstone hearth houses the multi-fuel burner with oak mantle over. The kitchen is well appointed and is fitted with 'Pippy Oak' units with brushed chrome handles, white ceramic sink with mixer tap and cream 'Cannon' range cooker. The utility area has space for washing machine and from here French doors lead out onto the raised decked patio taking in the stunning views. Sitting Room: Streamed with light with two sets of French doors leading out onto raised decking taking advantage of the breathtaking views. En-suite: Free standing basin unit and corner shower with power shower. En-suite Bathroom: Three piece white suite with power shower over bath and chrome heated towel rail. 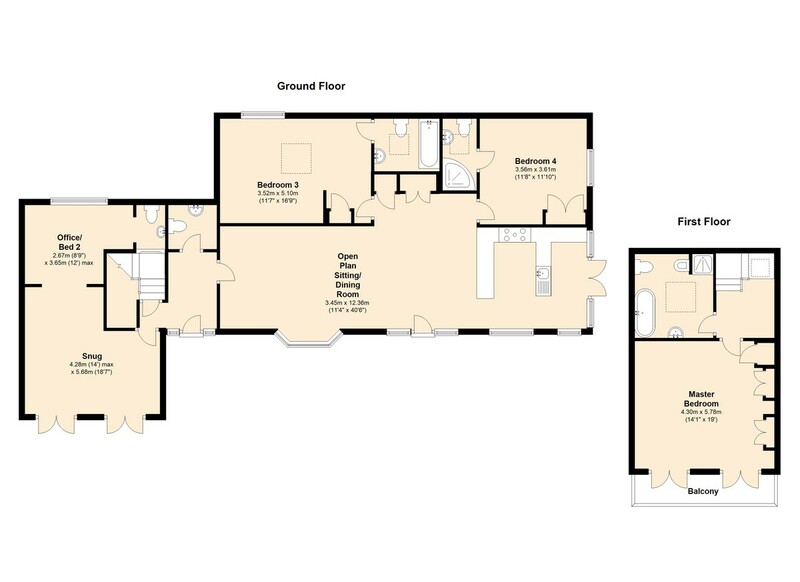 En-suite: Two piece white suite with corner shower with power shower. Master Suite: Stairs lead from ground floor to light filled landing with velux roof light leading into the fabulous master bedroom with two sets of French doors flowing out onto the balcony, overlooking the fabulous views. Master Bathroom: Beautifully tiled and appointed with four piece white suite with Jacuzzi bath, bidet and walk-in double shower with two power showers. EXTERIOR The property has a driveway leading to the single garage. The front garden is tiered with level flagstone area and steps leading up to the front of the property. There is a good sized level flagstone seating area with further raised decked areas which provide plenty of space for relaxing, entertaining and 'Al fresco' dining whilst enjoying the breath taking views. LOCATION Symonds Yat is in the heart of a designated Area of Outstanding Natural Beauty: The surrounding countryside offers a number of leisure activities including mountain biking, canoeing, rock climbing, walking and many other outdoor pursuits. The village has a number of riverside pubs and restaurants within walking distance. Whitchurch village is just 2 miles away and has an Outstanding Ofsted primary school and a superb village store. The market town of Monmouth, home to the renowned Haberdashers' Schools is 5 miles away. Ross-on-Wye is 7 miles and offers a wide range of amenities and access to the motorway network.